With more than 38 years as a full time artist, Stan has produced literally hundreds of paintings documenting historical events, people and places. He researches his subjects to assure the accuracy of the smallest detail to preserve its relationship in time. His work hangs in two presidential libraries. 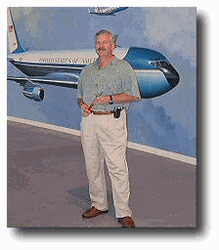 Commissioned by the Ronald Reagan Presidential Library in Simi Valley, CA, his 12 foot by 120 foot mural of the "History of the Flying White House" is on permanent display in the new Air Force One Pavilion. 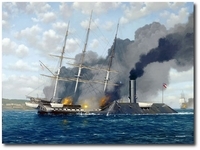 In addition, Stan's painting of the "U.S.S. Ronald Reagan" is hanging in the Legacy Room of the library. The George H.W. Bush Presidential Library in College Station, Texas, has two paintings by Stan on permanent display. Both are of the U.S.S. George H.W. Bush, our nation's next aircraft carrier. Stan is also working on a painting of the USS Oriskany for the National Museum of Naval Aviation, Pensacola, Florida. Three large fine art murals are in the Palm Springs Air Museum; The "Tuskegee Airmen", 12 feet by 60 feet, which has 51 portraits of the real Tuskegee Airmen, "Dauntless at Midway", 12 Feet by 34 feet and "Corsair on Approach", 19 feet by 55 feet. Since the mid-1980's NASA has commissioned Stan to paint 15 works ranging from the Space Shuttles to the SR-71 Blackbird. Stan has also painted numerous works for Burt Rutan, the cutting edge genius in aviation and space design. Stan's works hang in the Air Force art collection, the USAF Academy at Colorado Springs, the Pentagon, the San Diego Aerospace Museum, the National Museum of Naval Aviation in Pensacola, Florida, and the Smithsonian's National Air and Space Museum in Washington, D.C.
His work encompasses portraits, landscapes, aviation and space, ships, cars and his new collection of cat-related fine art paintings. 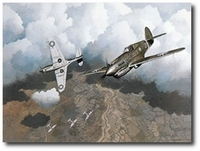 Stan's art has been published in numerous books and periodicals. His work is highly sought after by museums and collectors alike. In 1975 Stan won 1st place in the Benedictine Art Awards, and in 1985 won 1st place in the Smithsonian National Air and Space Museum's "Golden Age of Flight" art competition. In May 2000, the National Museum of Naval Aviation honored Stan with the "R.G. 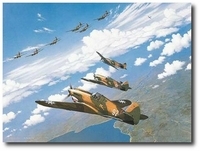 Smith Award for Excellence in Naval Aviation Art".